Yoga is a great way to exercise both the body and the mind. It helps keep you fit and flexible and it’s often a wonderful stress reliever after a long day. If you enjoy practicing yoga as a hobby or part of your exercise routine, there are dozens of products on the market that can help you get the most out of your session and come away feeling stretched and refreshed. Here are some of the top products and equipment you can buy. A yoga DVD can give you new ideas and switch up your routine. “Yoga Stretch for Beginners and Beyond” has exercises particularly for people new to yoga, including two 30-minute routines. The video introduces gentle moves that can help you ease along at your own pace, without the pressure or discomfort of a vigorous work out. 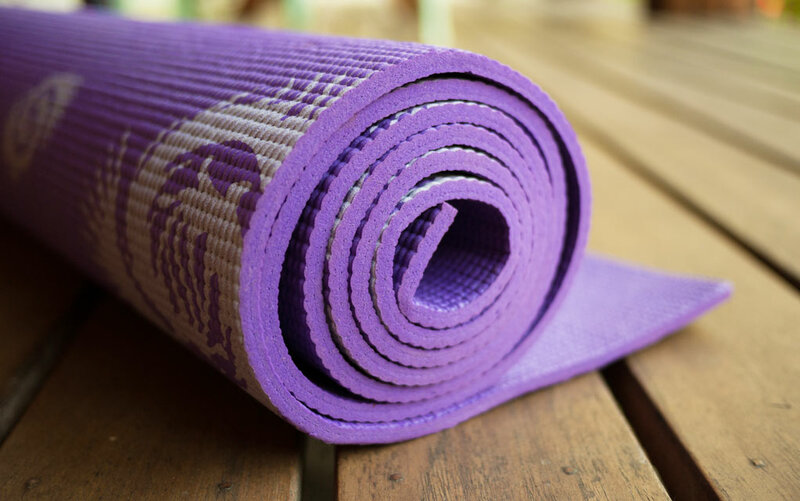 Having a yoga mat can protect you from slips or injuries during exercise. For example, the BalanceFrom GoYoga mat is affordable and light so that you can carry and store it easily. You can wash it using soap without trouble and without having to worry about tearing it. If you want some extra resistance to increase your flexibility, a yoga strap might be what you need. This exercise is made to help you slowly build up your endurance and overall strength. Sometimes your body is all you truly need if you want a good workout, but there’s nothing wrong with a challenge if you can handle it. Having a mat can help you avoid injury while practicing yoga, but you can also take the extra step by buying yourself a few pairs of non-slip socks. With grip studs at the toes and heels, you can hold poses for longer than with regular socks or your bare feet. Meditation is often a large part of a yoga routine, but if you plan on sitting in the same position for ten minutes or longer, you probably don’t want to sit on the hard floor. Meditation cushions are designed to conform to comfortably fit your spine, hips, and legs so you can relax and let go of excess tension. Investing in any of these items can open you up to new poses and exercise ideas. If you enjoy looking and feeling fit, these are the products to try that can help make your routine safer, healthier, and more comfortable. Feel free to let your passion for yoga shine through!